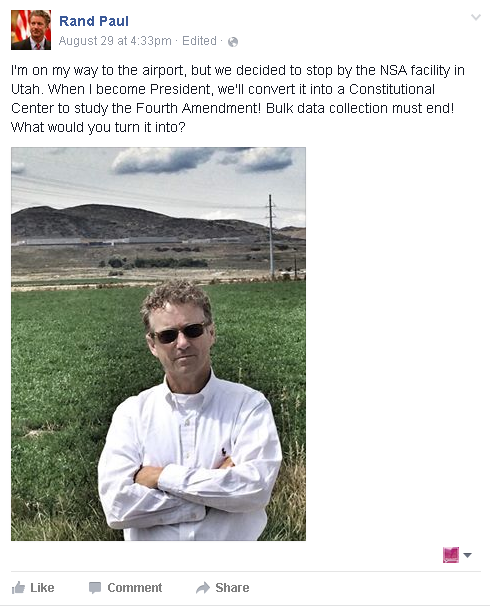 Subject: Rand Paul: Close the NSA! The Kentucky senator stopped by the controversial Utah National Security Agency (NSA) building on Aug. 29 for a Kodak moment. He took a selfie standing out front of the facility, donning sunglasses and a solemn expression. Then he posted the photo to Facebook along with the following statement: "I'm on my way to the airport, but we decided to stop by the NSA facility in Utah. When I become president, we'll convert it into a Constitutional Center to study the Fourth Amendment! Bulk data collection must end!" Paul’s promise came just a day after a crucial NSA appeals court ruling. Conservative lawyer Larry Klayman, whose client was suing the Obama administration for spying, was unable to convince the court the plaintiff had indeed been spied on by the government agency. In February 2014, Paul filed a similar lawsuit against the Obama administration. He charged the White House with illegally obtaining data on citizens. Paul’s lawsuit was halted, however, on Sept. 22, 2015, by Federal District Judge Richard Leon, pending the result in Klayman’s case. The ruling against Klayman was a setback for those who support limits on the NSA’s reach. But Judge Leon reached out to Klayman and “practically begged” him to continue his battle, reported U.S. News on Sept. 2. He laid out a step-by-step guide for the lawyer to follow on how to get the NSA government surveillance case revived. Leon told Klayman, first and foremost, that he should seek out a new plaintiff. Should Klayman’s case indeed see the light of day again, there’s a chance Paul’s could as well. However, the two cases do have a few potentially material differences. For instance, Paul’s involves all manners of mass surveillance, whereas Klayman’s only focuses on the illegal obtainment of cell phone data by the government. Whatever the outcome, Paul’s opposition to government spying sets him apart from the 19 other Democratic and Republican 2016 presidential candidates. Should the Kentucky senator win the GOP nomination – and eventually the presidency – there’s a chance the NSA may actually be shut down.